Beautiful winter weather here in Daintree with cool nights, foggy mornings and clear warm days - just the way we like it! I must say, though, that it is about time after 6 months of wet weather and making it to 3.7 metres of rain so far for the year. Everything is starting to dry out, which is very satisfying, considering the amount of mould we have had to deal with this year. The garden is also starting to reshoot quite nicely after the cyclone. We still have a few stumps and chunks of wood to move, but things are looking better. One of the effects of having a cyclone go through is that it wipes out all the fruit and flowers in the forest and the garden for several weeks, if not months. It's hard work keeping up with bananas and pawpaws, coconuts, seed and nectavite for all the hungry honeyeaters, friarbirds, drongos, riflebirds, doves, scrub fowl and turkeys that are standing around rattling their feed bowls every morning! Even the scrubfowl have taken to jumping up onto the feeders. We have never seen so many Victoria's Riflebird (female only, unfortunately) in the garden as this year. This poor girl hit a window, but survived to tell the tale. Fortunately some of the palms are starting to fruit again, so the riflebirds are having daily disputes with the figbirds and orioles for each fruit as it ripens. A visit from a lovely Amethystine Python this week as it warmed up in the sun for a while before disappearing into the shed. Only about 2 metres in length and not very big. Some horrible 'frog-strangling'- type noises from up high a couple of days ago suggests that it hasn't gone far. 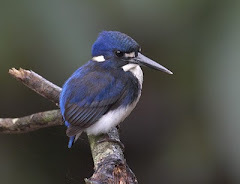 Good news for birding locally with good sightings of Little Kingfisher, Azure Kingfisher, Great-billed Heron all on the Daintree River and some great winter specials such as White-eared Monarch and Black-faced Monarch also. Spotted Whistling Ducks (2) also on the river for a day or so, but not seen since. Great sightings of Southern Cassowary north of the Daintree River at various locations such as The Icecream Company, the Beach House and Jindalba Boardwalk. It seems that the sub-adults have been sent away and are looking for their own territory - several have been seen alone in the last week or so. 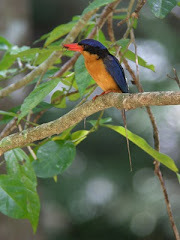 Double-eyed Fig-Parrot, Wompoo Fruit-Dove and Fairy Gerygone are birds of note in the garden at Red Mill House as well as the Victoria's Riflebird.